Does your kiddo often dream about a life at sea? Does he wish to sail across the ocean and discover adventure upon every shore? Well, if finding ancient treasures and evading imperial naval fleets sounds like endless fun to your young swashbuckler then he surely has quite the exciting life ahead of him. You better make sure he looks prepared to start this wondrous career of piracy. 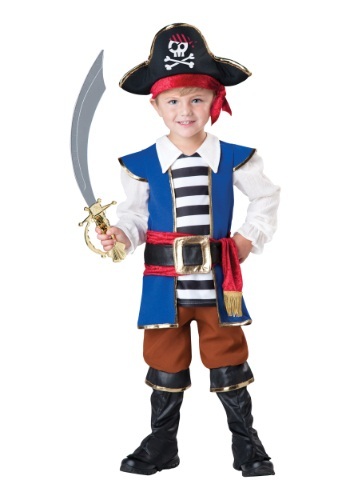 We’ve got just what he needs, take a peek at this awesome Toddler Pirate Captain Costume! His transformation into a feared pirate will be nearly complete with a single jumpsuit. Never before now, has a jumpsuit been so nifty as well as practical. The shirt, vest, pants, belt and even the boot covers are all attached and a part of this amazing one-piece. Then to top off this outfit your kiddo can just throw on his foam-formed pirate hat with the attached sash and he’ll be ready to take command over the most-feared pirate crew in the seven seas! While pirates spend most of their time looking for buried treasure your kiddo may also run into a few battles while at sea. You’ll want to make sure that he is properly equipped so that victory over any scurvy scallywags that dare go up against him is a sure thing. We suggest grabbing him one of our Pirate Cutlasses and maybe even a toy pistol! He can use this Halloween as a test run to master these classic pirate weapons and then he’ll be ready for his dream life as an infamous pirate! Now you just need to help him come up with an awesome pirate name… something like Captain Half-Squat or Captain Shin-Kicker, both sound terrifying to us.